She liked it better when swimming lessons were colours, not aquatic animals or numbers. Yellow is better than Dolphin and Maroon is better than 4. 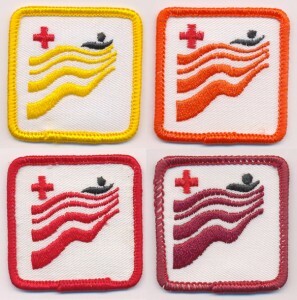 It makes more sense to go from Grey to White to Bronze Medallion than 11 to 12 to Bronze Medallion. She doesn’t even know if the numbers and animals get badges anymore. Back when there were colours, you always knew if you passed because there’d be a paper clip on the outside of your report card, a badge making it thicker than if you hadn’t passed. And when you did pass, your mom could sew your badges to your bathing suit, all the way up the left side, picking out stitches from old bathing suits and re-sewing onto new bathing suits before Canada Day. Back then, the Red Cross logo only had one swimmer, its tilde arms reaching over rippling waves. Now there are two swimmers but there is still an embroidered red cross, a sun above the waves. ps: And if you’re a fan of swimming (and even if you’re not! ), this swimming memoir by Leanne Shapton is a stunner!